What an awesome night! I see a ton of music by myself, but I ended up with a hearty group of friends Saturday night, all right up front along the barricade. It was a truly A+ evening. The folks at Empire Chinese Kitchen recognize me (it’s my go-to) and know that I’m probably grabbing a quick dinner before a show when I snag a solo seat at the bar, but my friend Colin (who I met years ago at Josh Ritter show) and his friend Meghan met me for pre-show drinks. I picked up my photo pass at the State Theatre box office and quickly made my way to the stage and grabbed a spot in the front row on the barricade. Colin and Meghan joined me, and my friend Bob surprised me by driving up from Massachusetts to join us (he and I met at an Iron & Wine show back in 2011 at the State Theatre). I chatted with Ashley and Marsha who were next to me along the barricade, and when my friend Grace and her husband Trent showed up, they all already knew each other. So what I’m saying is that Josh Ritter brings good people together and it was a delight to see a show with so many wonderful people. My friend Bartlett joined us, and then his friends Nick and Sarah showed up, too. It was a party. I am a fan of show opener Good Old War, and I arrived when doors open to be sure I’d be right up front. I first saw Philadelphia’s Keith [Good]win, Tim Arn[old], and Dan Sch[war]tz open for Brandi Carlile back in 2010, but hadn’t caught them live since 2015. I supported their Pledge Music campaign to produce Broken Into Better Shape, and I wear the Good Old Warrior t-shirt they sent me often. It was a little strange to see them in such a big venue, because the thing I’ve enjoyed most about them live is how intimate it feels. They played an entire glorious set unplugged standing in the middle of the crowd when I saw them in 2015, but I suppose that’s not something an opening band can pull off when most people are usually only there for the headliner. Folks in the audience listened during their set, and I saw a bunch of people up front singing along to all of the songs, too. I was so glad to hear “That’s Some Dream,” “Amazing Eyes,” and “My Own Sinking Ship” in person again. I’m pretty sure Good Old War didn’t play “Tell Me What You Want From Me,” which I expected to hear because 98.9 WCLZ plays it regularly. I am eager to see them as a headliner again, and hope they’ll come back to Maine soon. I have known about Josh Ritter for ages, and I’ve seen him a handful of times live, but I’ve never taken the time to dig into his music catalog until about a month ago. I’ve mostly gone to see him live because his music matters to people who matter to me and he puts on a great show. What I appreciate most about him as a performer is the joy he exudes in the form of a giant smile while he’s on stage. His music is layered and lyrical, and it’s laden with Bible references and heavy themes that don’t work for me as background music. What I’m trying to say is that his songs really deserve a listener’s attention. I also love a sad song, so listening to his newest album, Gathering, has been right up my alley. “Showboat,” “When Will I Be Changed,” “Train Go By,” and “Thunderbolt’s Goodnight” stick out to me on the album and all strike me as deeply personal, beautiful, and relatable. Josh posted on Facebook when his album dropped that “I have never lived in times like these. That music somehow manages to survive and matter amidst the chaos seems ever more miraculous, ever more something to celebrate and be grateful for.” We are living in strange, dark days, but Gathering helps me feel a bit better, because Josh eloquently captures the sadness and makes the darkness feel less isolating. This was by far the most engaged I’ve been at a Josh Ritter show. I’d listened to him a lot in the weeks leading up to the show, and it was the first time I knew a lot of the words and could sing along. The crowd was awesome. I remember a few moments during the show when I realized I could only hear Josh–which is incredible in a big venue with multiple bars. People who love Josh listen to him, too, I guess, and it was a welcome treat to really hear an artist like that. Since no one was pushy or drunk or yelling I could relax. 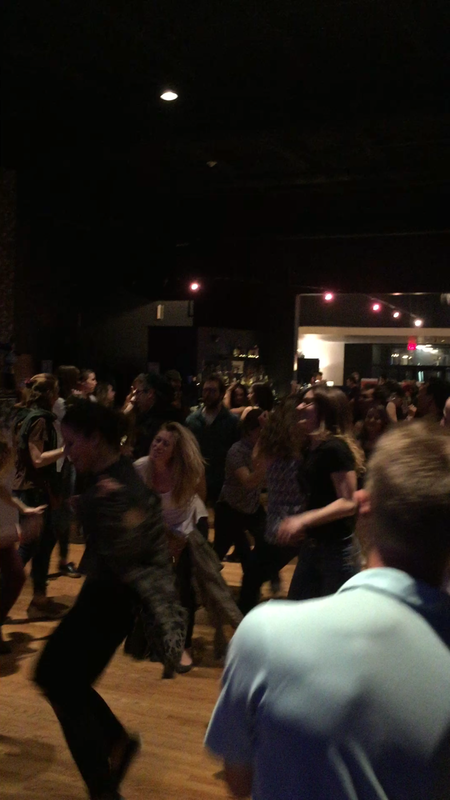 I took pictures during the first three songs of both sets, but I danced, had a few drinks, and enjoyed every moment. Josh didn’t say a whole lot during the show, but we did learn that “Train Go By” was about a stint living in the country, where the only entertainment was to go park by the train tracks and watch the trains go by. That adventure didn’t last long. Josh humbly expressed his gratitude for having the opportunity to write music and perform for a living. Josh did three songs acoustic in the middle of his set, and Zack joined him for “Hopeful,” which is one of my favorites. Check out these lyrics–“How many times did you give all your love/And find out it was so far from enough?/I followed her out into the street in the rain/And the whole world stopped spinning and just went up in flames.” I have a lot of respect for an artist that will bear their soul, and Josh is one of them. I loved the energy at the end of their set. They wrapped up with “When Will I Be Changed,” “Homecoming,” and “Getting Ready to Get Down,” which punctuated the night’s messages of hope and optimism and brought the energy up enough to encourage a dance party to end the show. I love acoustic music best, and loved the three song acoustic encore, especially “Roll On,” which is a song I didn’t know before. It has a particularly beautiful line in it, too–“Somewhere out there I believe in me.” Josh closed the night solo acoustic with “Girl in the War.” I loved this show and it hit me right in the feels to hear sadness, honesty, and hope mingled together in the air. 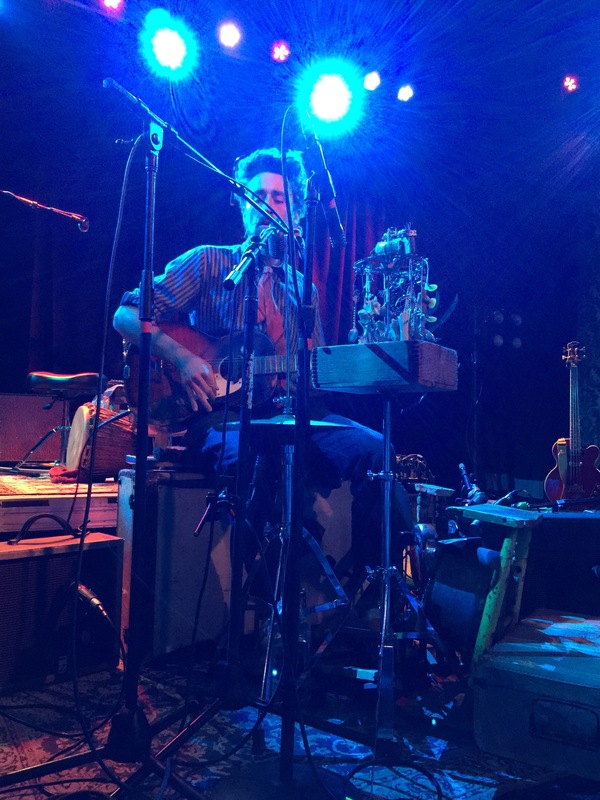 My friend Aimsel Ponti interviewed Josh a week or so before his Portland stop and asked some great questions that I wanted to know the answers to. Also, here’s a 45 minute set that Josh and bassist Zack Hickman played for 75 lucky fans at The Clown Lounge in St. Paul, and it captures their energy and current set list nicely. To the woman in the bathroom who told me you liked my highlights–you made my night! I don’t have highlights, just a lot of gray hair. My night wrapped with Bartlett, Nick, and Sarah over slices at Otto, and I ran into my friend Kevin Oates (the talented director of the Maine Youth Rock Orchestra) for hugs and catching up on the sidewalk on my way back to my car. This was such a fun night that was full of surprises from start to finish. Guster on the Ocean was a great time. I think I’m in the sweet spot age-wise of people who have known Guster since early on in their career as a band, so attending their 25th anniversary show with thousands of fans at Thompson’s Point was a treat. I’d had a busy week helping my best friend’s dad after back surgery, and I spent the afternoon with him at Maine Med before leaving to meet Rachel and Ian to Uber to the show. We set up a blanket in the front of the blanket area just behind the barricade, but were told to move (of course that area was littered with blankets later in the evening, which seems to happen every time I go to Thompson’s Point). We arrived early to enjoy dinner (I had an awesome grilled cheese with lobster from the SaltBox Cafe) and to explore the Reverb Eco Village (which earned us free Ben and Jerry’s ice cream). I also scored an awesome Guster on the Ocean Nalgene water bottle, which was apparently in short supply. I ran into so many people from all corners of my life during Spencer Albee’s opening set that I honestly didn’t hear a single one of his songs. I got to catch up with my friend Ben Cosgrove before he joined the Ghost of Paul Revere on stage on keys and accordion. Ben played a few songs on 98.9 WCLZ a few weeks later, and you should definitely check out the session. Ben is incredibly talented. With the very talented Ben Cosgrove! Loved running into the Dietz family! I loved seeing Portland’s the Ghost of Paul Revere play in front of such a big crowd. They had nearly a dozen musicians with them on stage, including Ben, Kevin Oates from the Maine Youth Rock Orchestra on cello, and a handful of other musicians that beautifully rounded out their sound. They had a blast up there, and I made my way to the stage to see them up close and easily enjoyed their set from the second row with some strangers who became fast friends. Good music is good for that. I was sporting my “The Way Rock Should Be” t-shirt from the Maine Youth Rock Orchestra, and I ran into Kevin’s whole family and got to chat with them in between sets, too. I guess I was technically wearing the shirt of the band to see the band, but I don’t care. So was Matty Oates! I have been listening to Ghost’s new song, “Montreal,” on repeat. It’s fantastic. I am pumped to hear their new album soon. It’s always a pleasure to see GPR live. They also just announced back-to-back shows on December 30 and 31 at Port City Music Hall, which is the next time they’ll play in town because they’re off touring basically every minute until almost 2018. I’m so happy to see this band getting some of the notice they richly deserve. Me and Matty Oates showing our MYRO support! Guster took the stage and we partied for the rest of the night. It was great fun. I loved hearing most of my Guster favorites–“What You Wish For,” “Barrel of a Gun,” “Parachute,” “Either Way,” and “Happier”–live. Guster isn’t playing live much these days, but my alma mater hosted them for a private gig two years ago for Homecoming, and I got to be front and center for that show. I decided to enjoy this show from further away this time, and take it everything Thompson’s Point has to offer. 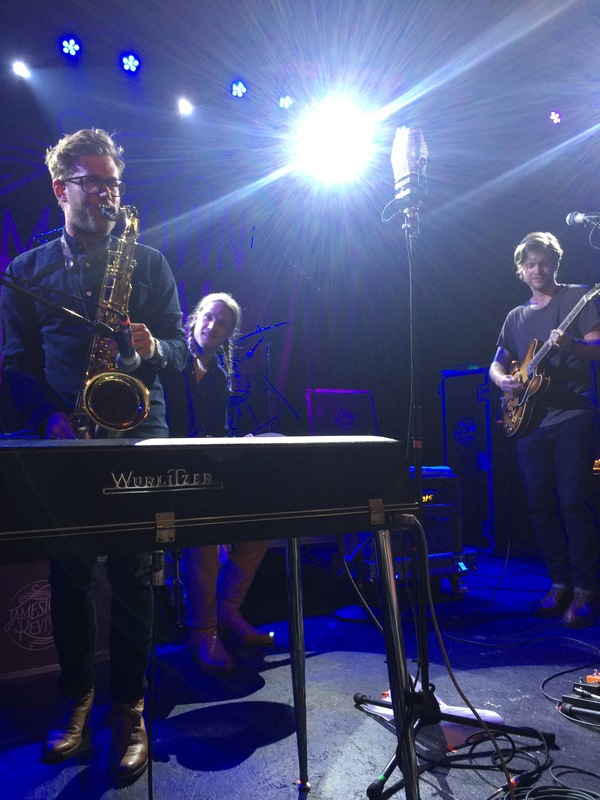 The phenomenal Maine Youth Rock Orchestra joined Guster for nearly half of the show, and they enriched the sound and elevated the show to another level. Guster was pleased as punch to host this party, and were chatty and grateful all night long. Ryan asked Kevin who the youngest member of MYRO was, and we all chanted “Luke, Luke, Luke” while he accepted a standing ovation. Ryan even freestyled a song for Luke in that moment and the huge cheered along. It was incredible. What a way to make those kids understand they are already rock stars. I loved everything about this night. Let’s do it again next summer! Some shows totally catch you by surprise, and this was definitely one of them. It was well timed, too, because it was also my birthday. This show really made the first day of my new year a special one. I got to Port City Music Hall early enough to snag my favorite spot, and I ran into and got to catch up with Maine Youth Rock Orchestra Executive Director Kevin Oates. It was a treat to be greeted with a big “Happy Birthday” and a hug from him to start the night. Kevin had to head backstage to get ready, and a small crowd emerged just in time for Hannah Daman and the Martelle Sisters’ opening set. I saw Hannah and the Martelle Sisters for the first time back in September, when they played with a bigger band and opened for Kaleo. I liked them back then, but they were even better at this show. They took the stage, just the three of them, with a guitar, mandolin, and violin. I was impressed by the fullness of the sound they created. I was glad my friend Marian showed up early on in their set to enjoy it with me. Kevin joined them on cello for a couple of songs, and it’s always a pleasure to hear him play. A proper crowd streamed in during the opening set, and people were clearly pretty pumped to see Magnolia, Texas’ Jamestown Revival. I’d skipped their first visit to Portland back in October because I didn’t know their music then and it can be tough to get pumped for Sunday night shows, but I regretted it. I was glad for the chance to rectify the situation. Plus, The Ghost of Paul Revere is currently out on tour with them and has spoken very highly of them. Their endorsement matters. I got to catch up with Griffin Sherry after the show, too. He’s the best! 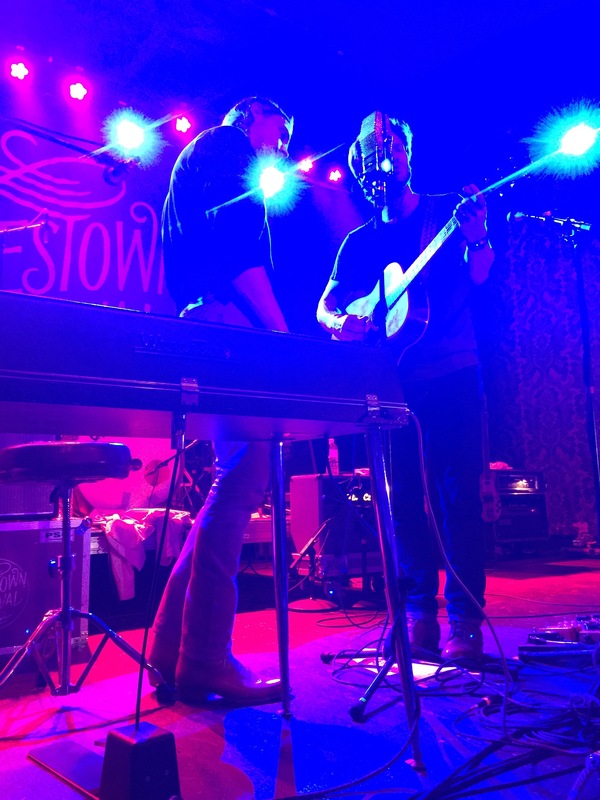 I was impressed by Jamestown Revival. I loved that the band took the stage sporting some combination of ten-gallon hats, cowboy boots, and toothpicks in a totally unironic way. Zach Chance and Jonathan Clay are the frontmen of the band, and they’ve been friends since high school. The band slayed. 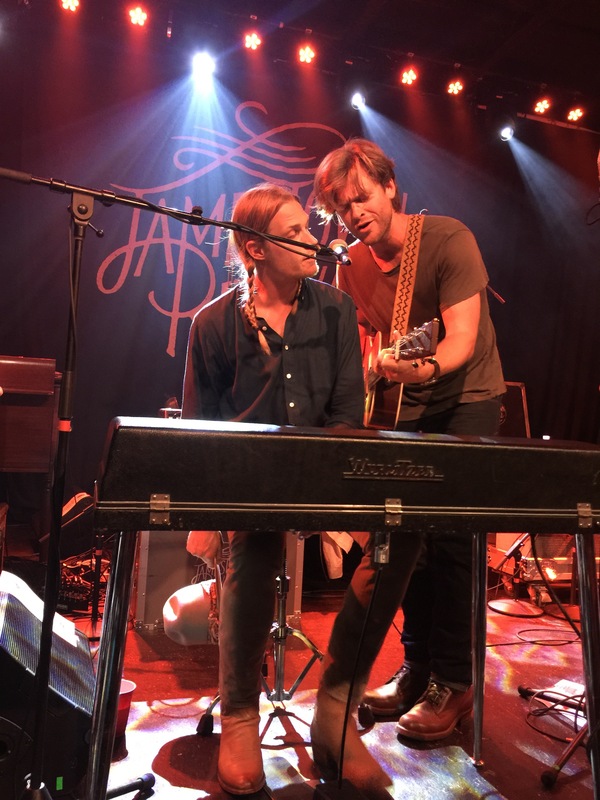 Every song was strong–and they interacted warmly with the crowd, played requests, and really made it a fantastic night for us. The audience was great, too. There were a lot of fans in the house and people danced and sang along. Early on in the set, Zach said that he could tell this was going to be a special night, and it truly was. 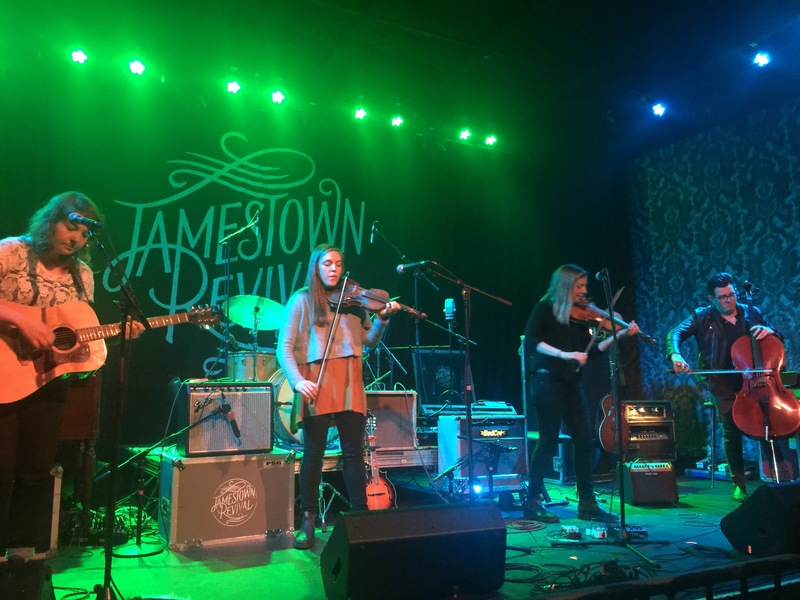 The crowd was a delight that night (which has such an impact on a show experience), and Jamestown Revival really brought it. The moment the band left the stage, Port City turned the house music on and “Footloose” flooded the room. An impromptu dance party broke out, and a woman I didn’t know grabbed me to dance with her. 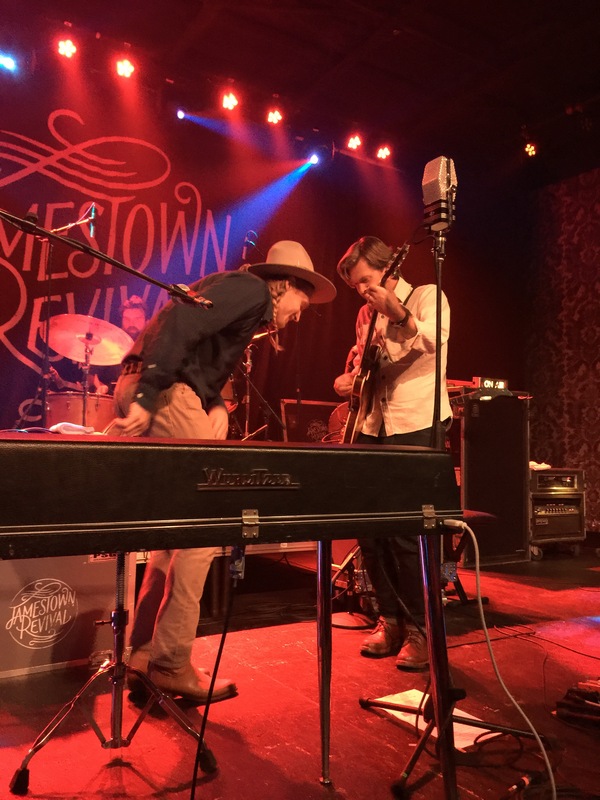 It was a total blast and shows perfectly the mood Jamestown Revival created in that room that night. We didn’t want the night to end. What a show! Definitely see this band live! A blurry picture of a happy moment dancing to Footloose after the show! 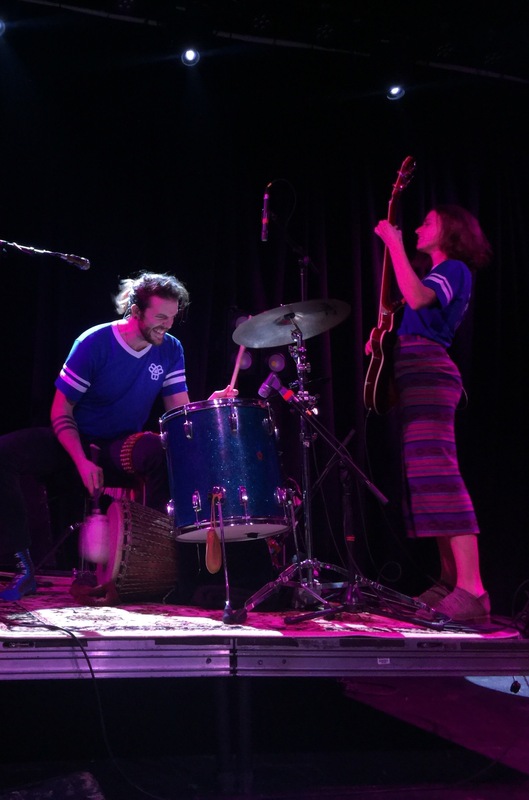 I love the Ballroom Thieves and have seen them live many times. They’re definitely one of my favorite bands. I was under the weather, but decided to go to this show anyhow, because my friend Marian saw them a few days earlier in Camden and said they’d been particularly “on” and extra fun and very chatty with the crowd. Colin saved me a spot up front because I rushed down to Port City Music Hall after being honored by one of my favorite senior boys on my school’s basketball team at Teacher Appreciation Night. I arrived just in time to see Matt Lorenz, touring solo as The Suitcase Junket, take the stage. I hadn’t seen Matt play for a few years (I saw him play with his band Rusty Belle at One Longfellow Square with Darlingside and Caitlin Canty back in 2013), and never as a solo act. He stole the show. His one-man-band is a powerhouse. 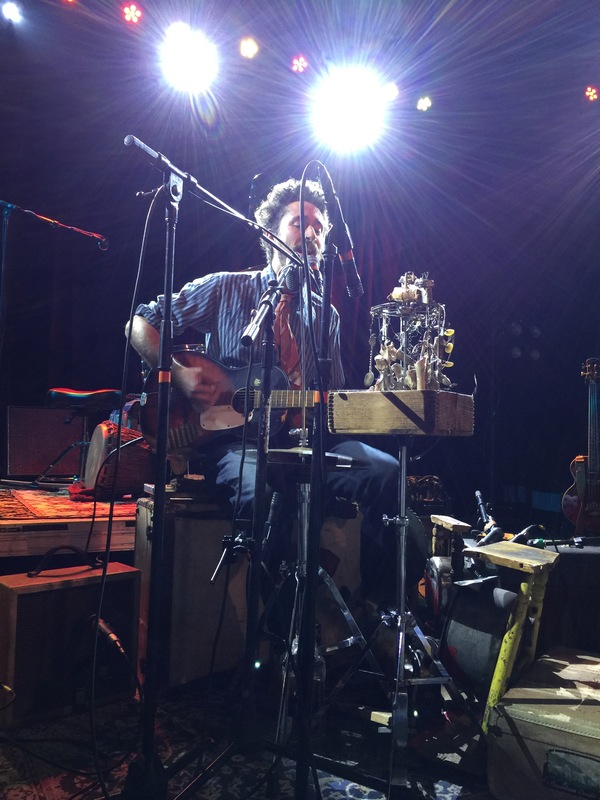 Stomping on a kick drum, shaking a collection of shells, bones, and silverware, and playing a guitar he saved from a dumpster, Matt’s vintage sound, and his clear, lovely voice filled the room. He was charming and engaging with the obviously impressed crowd. The Ballroom Thieves took the stage after a quick break. They are super talented and sounded great, as always. They didn’t interact much with the crowd, which I missed, so this wasn’t their typical high energy show. My dear college friend, Ken Templeton, was in the crowd reviewing the show for Boston’s Red Line Roots, and I was a little worried that he wouldn’t love them like I do because they were so reserved, but he was quite impressed anyhow. Here’s Ken’s review. All of the guys from the Ghost of Paul Revere, Kevin Oates from Maine Youth Rock Orchestra, Connor Garvey, and Max García Conover were all in the house to support the band, and it was nice to witness the camaraderie and to catch up with all of them. Not the best Thieves’ show I’ve seen by far, but everyone is entitled to a mellow night here and there.